Teaching myself how to make these easy sew curtains years ago has saved me hundreds, if not thousands of dollars. I know custom window treatments can get very expensive and sometimes it can be worth every penny. For me though, I like to change my mind too much to spend that kind of money. Over the years I have made different window treatments for our home but curtains aka window panels are by far the easiest and my favorite. Curtains are technically straight panels that are unlined. Iron and pin seams down before sewing. Sew sides first, top second, and hem last. Determine finished length of panel from top (including rod pocket) to the bottom where it will hit the floor. For example. My finished panel was 100 inches. After adding 8 1/2 for rod pocket and 3 1/2 inches for hem, my total cut fabric was 112 inches long. I tried to skip this step many times in the past but don’t be like me! It is so important if you want smooth, straight edges once your fabric is sewn. 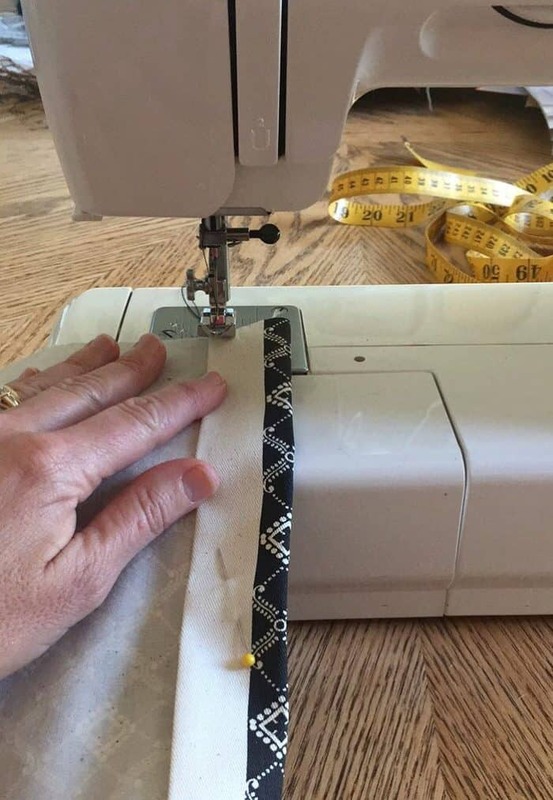 Iron your seam then pin it into place. You can pull the pins out as you sew. Sewing sides first is necessary so that when you sew the top and hem your edge seams are hidden inside. The only difference when sewing the hem and the top is adding an extra seam for the rod pocket. The width of this pocket will be determined by the width of your rod. Mine was one inch. Adjust your fabric cutting accordingly. The hem should be last so that you can be sure you have measured exactly right. 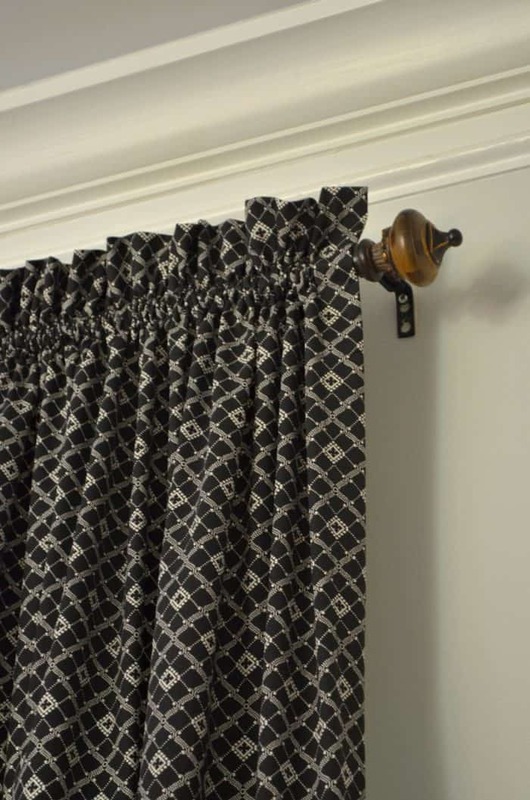 Once you finish sewing the top, hang your curtain on the rod. Next pin your hem like a pair of pants. Just grazing the floor. Iron the hem after then sew. 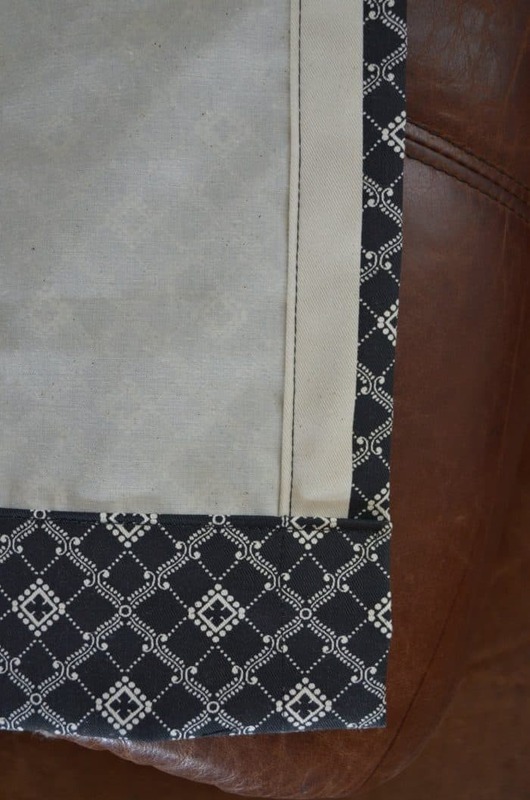 The photo below shows how I left the selvage edge on the fabric in order to keep the panels as wide as possible. I also like a thicker seam on the sides of the panels. 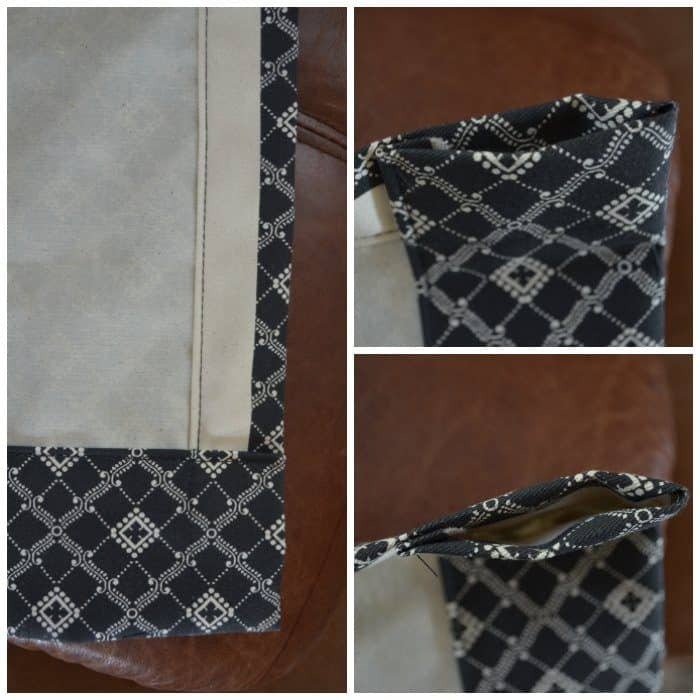 A wider seam gives weight to the fabric making it look more custom. 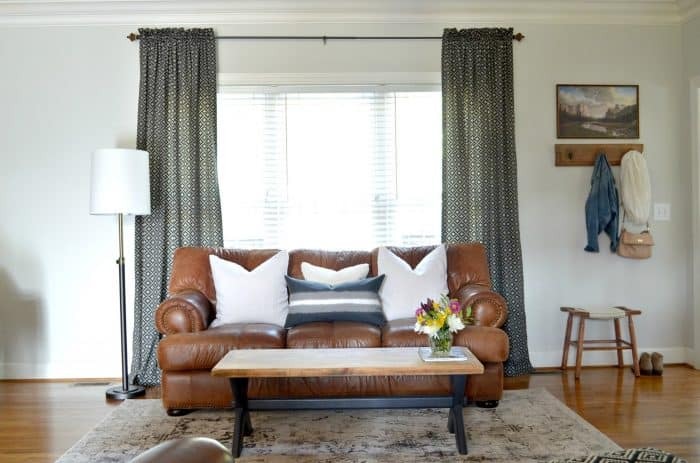 The curtains I made for our family room makeover didn’t take very long to make at all. Choosing fabric is something I love to do. I tend to have a few more yards of fabric around my house than I ever need. Like I mentioned recently in my DIY Rustic Shelf Tutorial, I’m more of a minimalist when it comes to stuff but I do have a weakness for fabrics. So don’t afraid to try a project yourself. You can really do more than you think. If you aren’t into sewing, grab a friend and trade services if they can do something maybe you can’t. Maybe you are better with tools and can help them build shelves like these.